One of the best-kept secrets in Kansas is the Gypsum Hills, sometimes called the Red Hills. Located on the Oklahoma border, the rolling hills, buttes, and mesas are graced with a generous supply of wildflowers. Red cedar trees dot the landscape. They, along with little bluestem and sideoats grama grasses, make this one of the most scenic areas in the Central Great Plains. The small blue fruits of the cedars provide food for one of the state's more unexpected wildlife species. During the winter months, flocks of mountain bluebirds are hundreds of miles from their usual haunts. They perch on roadside fences, hover over the prairie, and feed in the cedars. The cedars also attract wintering American robins, cedar waxwings, and Townsend's solitaires. Many of these roads are open range, meaning there are no fences between you and any livestock. This is all private land, so remain on the road. Be watching for armadillos, wild turkeys, deer, roadrunners, black-tailed prairie dogs, and elusive bobcats and coyotes. Under many of the area's bridges, cliff swallows build large colonies of gourd-shaped mud nests. Of special interest are the Texas horned lizards, collared lizards, western rattlesnakes, and tarantulas sometimes found by observant travelers. 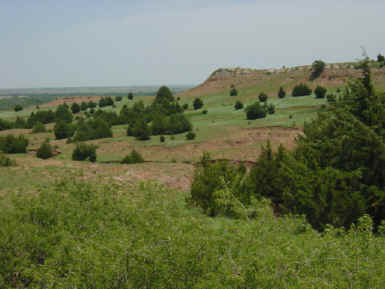 The Red Hills - or Gyp Hills - is a region of rugged hills, buttes and mesas in southcentral Kansas extending south into Oklahoma. The brick-red layers of shales, siltstones and sandstones with interbedded grayish dolomite and gypsum are the result of deposition in a shallow inland sea during the late Permian Period (260 million years ago). Millions of years of erosion have carved out the dolomite or gypsum capped buttes and mesas. The gypsum deposits are large and pure enough to be mined. Desert-like in appearance, the rainfall is high enough to produce an unusual mixture of big bluestem, little bluestem, blue grama, hairy grama and eastern red cedar. Dissolution of the gypsum layers has resulted in numerous caves, some of which are home to colonies of Brazilian Free-tail bats. No developed trails, but take the time to walk these seldom-traveled roads. Click the icon to find a birding list for Barber County. Directions: This interesting 49 mile drive begins in Hardtner (23 miles south of Medicine Lodge on U.S. 281). Most of the route is unpaved, but well maintained. Still, exercise caution if road conditions are wet. Begin in Hardtner on Central Ave, which is the main east-west road. (The street name changes to Hackberry Road outside town.) The land is fairly flat for several miles before you get into the hills. As you do, you will begin noticing tall, substantial fences. These are to keep in the bison on the 38,000 acre Z Bar ranch, which Ted Turner acquired in 2000. Be watching for a chance to see some of the herd. At 11.1 miles, check under the bridge over the Salt Fork of the Arkansas River for thousands of cliff swallow nests. At ~19 miles, turn right on Aetna Road. After a couple miles, you begin descending into the valley of the Salt Fork of the Arkansas River, offering sweeping vistas to the east and west. At 24.4 miles from Hardtner you will find a few buildings marking the remnants of Aetna. You will find Deerhead (just one building) at 36.7 miles and U.S. 160 at 39.7 miles. To explore further, take U.S. 160 west 1.2 miles and travel north 7 miles to Sun City. (In Sun City, Buster's is a good choice for lunch.) From Sun City, you may either backtrack to the highway, or drive east down the Medicine River valley road to Medicine Lodge. Anywhere along this drive is a great spot to enjoy a Kansas sunset! In the evening twilight, watch for bats fluttering overhead near streams as they emerge from the many hidden caves in the hills. 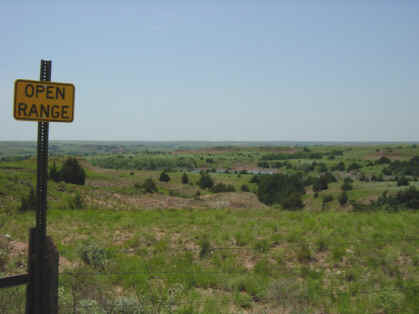 The Gypsum Hills Scenic Byway follows U.S. 160 from Medicine Lodge to Coldwater. It offers an all-weather route for visitors.